Award-winning illustrator José Ortega of New York City and Toronto created the USPS new stamp, Garden of Love. Ortega, who was born in Ecuador, was trained at The School of Visual Arts. He says, "Garden of Love depicts the abundance of life, its generosity, whose spirit is to be shared by all its creatures. Love's definition is broader than romantic love. Love is that colorful, full feeling you get when you enjoy being a part of and sharing in the generosity of life." 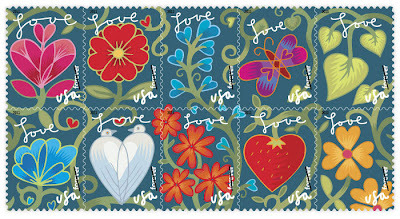 We think the Garden of Love stamp is a charming addition to the USPS Love Series. You can see more of Ortega's art here, including numerous public installations. His commissions have included work for Absolut Vodka, Apple Computer, and Sony Music. LOVE this!! I just went to the post office & they said there were no new ones - think I have to revisit- I want these beautiful stamps to properly adorn my notes! !